Students Grade 6 thru 12, join us every 4th Friday for games, food, and more! New Events every month! All parents and guardians of children age 0 to High School Senior are invited to attend this special night where you will learn about the Vision of Garden Sanctuary ministry for your children. This is a great opportunity to connect with Staff, Volunteers, and other parents. We are gathering to prayer walk at the Southeast’s busiest abortion clinic. Interest Sign-up sheet available at Guest Services. See Wendell or Mary Shelley for details. On this day, we will honor all of our High School and College graduates. If you, or your child, are graduating see Pastor Mark to get signed up. This one day event is designed to help marriages grow stronger as husbands and wives are reminded of the power of Us. The day will include group sessions and breakouts led by professional marriage and family counselors. Meal and refreshments throughout the day also provided in the cost of registration. Childcare provided. Join us as we spend the day dwelling in the presence of God. Interceding for our church and our city. The Bridge, Garden Sanctuary College and Career Ministry, will be having their Christmas Party on Dec. 16th. This event is for adults post High-School to age 35 who are unmarried. Please sign up at guest services. Group trip with special discounts to Hamricks in Gaffney. Will depart from the church at 9 am. Purchase a Christmas Tree to change the lives of Children globally and locally. 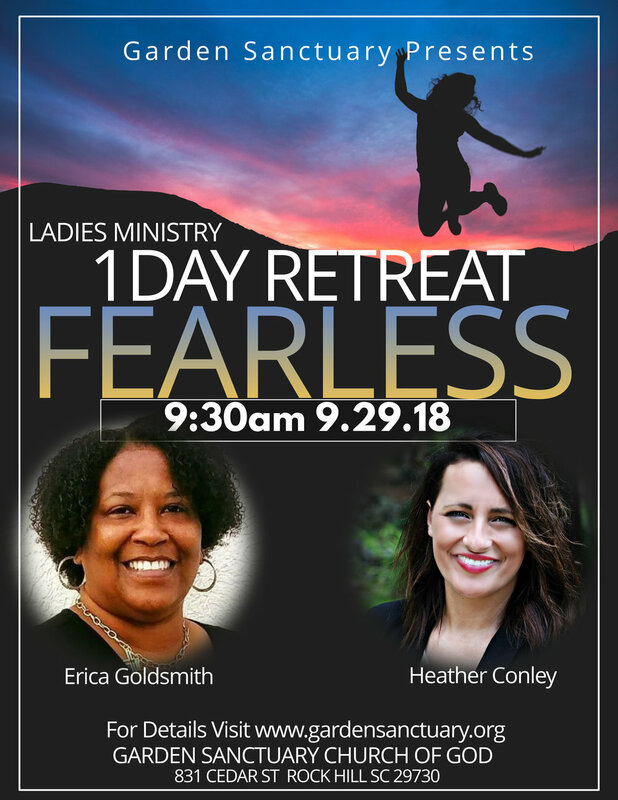 One Day Retreat where women will be join together for Worship, Fun, and the Word of God for their lives. We are gathering to be equipped and empowered to live without fear no matter the obstacles we face. As daughters of God, we are called to be FEARLESS! Featuring Garden Sanctuary's own Heather Conley and Special Guest Erica Goldsmith. Click Here to Register Early Bird Registration Cost is $20. After September 2, 2018 Registration is $25. In cooperation with the City of Rock Hill, we have been assigned a house to paint. All hands on deck. Please sign up at Guest Services. Meeting for Worship Team, A/V, Youth Workers, Children's Workers, Security, and Hospitality Team. Join us for a 12 hour day of prayer. Stop by for an hour or pray all 12. We are gathering in expectation of a move of God. The Bridge is for unmarried adults from Age 18 to 35! See you Sunday the 2nd for a time of fun and fellowship! Breakfast is served! Seniors, join us in the dining room! FREE SEMINAR for parents of High School students, and students as well. ALL HIGH SCHOOL PARENTS NEED THIS INFO! AND THIS FREE SEMINAR! Taught by School Resource Officer with over 2 Decades of Experience. Will cover Safety, School Law, Social Media, Drugs, Gangs, Bullying, Cyber-Safety, and much more! Completely FREE! And there will some cool prizes given away. Garden Sanctuary will be a rest stop for Rock Hill's Wounded Warrior Ride. Come out and cheer on these heroes!